Based in New Jersey, Advent are one of the most distinctive bands on the current US progressive rock scene—though not one of the most prolific, having released only two albums since their inception in 1989. Now, nearly six years after the release of their second album, the highly acclaimed Cantus Firmus, Advent are busy writing material for their forthcoming third album. With a return gig that took place on December 11 (together with another talented New Jersey outfit, The Tea Club), and some recent lineup changes, the band are set to begin 2012 with a bang. Some time ago, I contacted core members Alan Benjamin and Henry and Mark Ptak, who have been so kind as to provide exhaustive answers to my questions. Let’s start with the usual, very boring question on Advent’s beginnings, for those of my readers that are not yet familiar with you. Alan: I moved to New Jersey in 1987 and very quickly formed my first prog band, Tangent, with an old friend from high school. Within a year and a half, though, the project imploded and I went into a phase of trying to find an established group that had an opening—but that only led to a series of auditions for bands that I knew I would never be happy joining (usually something I could tell within the first 30 seconds). Once the realization hit that there probably wouldn’t be a satisfactory group to join, I decided to place an ad in a local (New Jersey) musician’s magazine called The E.C. Rocker to see if I could at least find any compatible collaborators—and, thankfully, Henry answered. With the previous series of “nightmare auditions” looming in recent memory (at that time), I thought it best to schedule a preliminary meeting where we would do nothing more than listen to recorded samples of each other’s music and discuss our mutual interests. It only took a few measures of hearing Henry’s first tune on tape—a solo version of “Rear View Mirror”—for me to realize that this was exactly the type of person I wanted to work with. Fortunately, he seemed to like the tapes of my music as well, and Advent was born. Mark (Henry’s talented brother) graduated from Berklee the following year and immediately joined to complete the three-member core that has existed for over 20 years now. What are your respective musical backgrounds and main influences? Henry: My earliest influences were probably popular recordings of Polish songs my folks used to listen to—and they also had some classical stuff around (mostly Chopin, and things like Addinsell’s Warsaw Concerto), some of which I’d wind up hearing in popular-rendition form on Liberace’s TV show at that time. Like most people, my exposure to rock ‘n’ roll was from the local radio stations—Duane Eddy was an early favorite, followed by Elvis Presley, Hank Ballard, and Roy Orbison. By the time the Beatles arrived, I was already taking guitar lessons at the local music store. J.S. Bach, Procol Harum, and Keith Emerson got me into keyboards a few years later, and Genesis and Gentle Giant cemented the relationship. I got back into the classics mostly because of them—and Blood, Sweat & Tears (D. Clayton-Thomas era) also got me into jazz. Once the classical and jazz fields were opened up for me, I just devoured whatever my teachers (and anyone else whose opinions I valued) recommended. I listened to everything—a lot of the record stores back then had very knowledgeable staff in each department, and when they were unavailable, you could always look through the Schwann catalogs for a listing of those works most commonly performed by the best-known pianists and orchestras. In addition to Chopin, Rachmaninoff and Ravel were big favorites. Alan: Having grown up with an intensely musical mother (who was quite an accomplished pianist and songwriter), music was everywhere in my early life. My mom likes to brag about how I “begged her for piano lessons” when I was two, but she forced me to wait until I turned three to start. Although dabbling with chord patterns from simple song books on my dad’s old F-hole Vega acoustic guitar, I eventually decided to take up the violin (around age eight) and became a bit of a child prodigy on the instrument, playing classical music with what had to be the best elementary school orchestra in New York City and also taking on extracurricular ensemble work. My entire world became disrupted at age 12, however, by being sent (against my will) to boarding school in Pennsylvania—and, for some strange reason that I’m sure I’ll never uncover at this point, I was not permitted to bring my violin with me. On the bright side, though, my second roommate there obsessively played three albums that, almost immediately, shifted my primary interest toward rock music (in order of importance): Queen’s Sheer Heart Attack, Sweet’s Desolation Boulevard, and Kimono My House by Sparks. My mom bought me a Conn acoustic guitar that Christmas (which I was actually allowed to keep at school) and that ended up representing my ultimate change of primary instrument. For the sake of brevity, I’ll just list some of the artists I discovered between that time and the end of the 1980s, in chronological, that each had a lasting impact on my musical psyche (in addition to Queen, the one that had really stuck from my roommate’s initial exposure): Rush, Kansas, Genesis, Dixie Dregs, Gentle Giant, Saga, and Pekka Pohjola. The most significant long-term inspiration came from Gentle Giant in the early days followed a bit later on by Pekka Pohjola. I should also add that purchasing Mike Oldfield’s Tubular Bells when it was brand new (over a year before going to boarding school) also seems to have had a lasting impact in the way I approach composition and arrangement, although this is something that generally seems to manifest itself in a more structural/logistical manner. Mark: I’m going to work backwards here. Lately, it’s been a good deal of sacred music. Singing in a number of church choirs over the years (some with Henry) has opened up the door to some wonderfully beautiful music that I would never have known was out there otherwise. Before that, there was my training from Berklee in Boston. Over there I honed my music theory, arranging, and jazz harmony skills, while also learning how to get around technical aspects of the studio. And Henry stands behind all that, actually—because it was from him that I received exposure, at a very early age, to Gentle Giant, Procol Harum, Genesis, ELP, Weather Report, and various baroque, romantic, and classical composers. He was also my first music-theory and piano teacher—and a tough one at that. Of course, it didn’t hurt to look at all that cool ’70s keyboard gear he had amassed by the time I was about five or so. That’s probably what started the ball rolling, really. What is the story behind your name, short and sweet like many of the names of historic prog bands? Mark: I believe Alan’s wife, Amy, suggested the name. And naturally, Henry and I being practicing Roman Catholics, identified with its liturgical significance in the Church as one of expectation, or “coming,” as it were, of Christ’s Nativity. So that felt positive, we thought. Plus, it had a nice, short, and “final” kind of ring to it when pronounced. So yeah, I think it works well. Alan: Yes, the name originated from Amy (my beautiful and musical wife), who used to be a rather serious keyboard player in her younger days. She came up with the idea of naming a band Advent back in college, but never had the opportunity to put it to use. When we were starting to think about band names, she shared the idea and we immediately thought it was perfect. Though Advent have been in existence for almost three decades, there have been long breaks between your CD releases. What is the reason for that? Alan: There are actually several factors that have conspired to keep things moving so slowly in this regard. The fact that we’ve always been a band of married guys with families and day jobs is probably the most significant factor—often resulting in having very little time available to actually work on music. Beyond that, a combination of several lineup changes and, for an extended period, trying to focus on too many activities simultaneously, set us back quite a bit. In fact, I don’t think we would have ever finished Cantus Firmus had we not made a conscious decision to stop looking for new band members and dedicate virtually all our time to making the album. Additionally, our material is often very complex and intricate, and it just takes a significant amount of time and effort to get the tunes written, arranged, rehearsed, recorded, and mixed to our mutual satisfaction. Henry: The short, brutal truth of it is that we have to continue to support ourselves while attempting to keep Advent moving forward. As wonderfully supportive, generous, and dedicated as the people in the prog scene have shown themselves to be in their commitment to keeping the music alive, there simply aren’t enough ways to sustain a full-time living from writing/performing exclusively, so we all have to do other things to keep the electricity turned on in what has proven to be an increasingly precarious economic environment. I teach piano full-time, and perform with an all-Beatles show called Mystical Majesty Band in addition to writing and playing in Advent, and it’s still a daily struggle to maintain the kind of sustained attention and focus that work as detailed as ours tends to require. When something is finally finished, we’re all happy with the results, but getting there (especially today) often demands the kinds of interruptions such as are required for simple survival. What about your recent lineup changes? Have they influenced the writing of your new material? Although I can’t really say these changes have dramatically influenced the way we’re writing or arranging new material for the album, we are starting to think about optimizing some of the arrangements for a single guitarist due to the fact that Greg (Katona, our second guitarist) is not planning on participating in future live performances with the band at this point. I’m very happy to say that Greg is still very actively involved in both our creative and recording processes, though, and has already laid down some beautiful guitar work for the third Advent album. You have been called the most European-sounding of American bands, and especially Cantus Firmus shows your fascination with the Old World and its centuries-old musical tradition. Can you expand a bit on this particular subject? Henry: I think the way we approach form has a lot to do with that. Most popular music (including many jazz standards) follows either a 12-bar form, or a standard “verse/chorus/middle eight/what-have-you” formula, which is very well-suited to shorter works. With longer pieces you have to consider how to sustain musical interest as you stretch out. I have nothing against the solution of extended soloing to fill the time, especially in the hands of great players like Pat Metheny, Joe Zawinul, or Herbie Hancock. However, I’m not drawn to that particular solution in the same way that I am to models which are more in line with the European classics, and if you go down that road, it’s inevitable that you’ll “discover” sonata form, counterpoint, thematic development, and all the rest of it—and pretty soon you find yourself referencing musical antecedents that lead all the way back to Gregorian chant. I’ve always been of the opinion that the audience which grew up on a diet of the simple pop tunes of early rock ‘n’ roll eventually wanted something a little deeper by the mid-sixties, which would account for all of the classical/jazz/folk/rock hybrids comprising much of the early prog catalog that became popular soon afterwards. I personally think it represented a hunger to reconnect with musical roots that ran deeper than the weekly chart-breaker—and, for me at least, that meant European music, which I believe is the best we have. Do you see yourselves as “retro-prog”, and what is your opinion of such a label? Do you see it as unfair, or do you wear it as a badge of pride? Alan: I don’t think the “retro-prog” label can accurately be applied to Advent—at least not based on any music the band has released up to this point. That being said, I believe our musical ethos to be more in line with many of the classic prog bands than most of the acts who fall quite squarely into that “retro” category. To further qualify, I think virtually all these (retro-prog) bands feature arrangements—especially from the standpoint of timbre—that sound as though their recordings could have been made in the 1970s. Our music, however, does not favor that approach at all and contains at least as many textures that would never have been heard back in prog’s heyday. Or, to put it another way, I like to think that we expand rather significantly on the retro sound, while still leveraging at least some of the elements that made classic prog music so appealing—but I don’t think anyone would ever mistake any Advent tune for having been recorded over 35 years ago. Henry: If, as I suspect, “retro” is to be understood as describing a musical approach with influences directly traceable to the best work of earlier practitioners of a particular genre, I suppose I’m OK with that. Even to call what we do an “homage”, or “in the manner of” is in my opinion misleading, because (as Alan has already expressed), there’s other things of a more eclectic nature in what we do. The influences are there, sure, but the problem with the word “retro” is that it leaves one wide open to the philological mischief it affords to self-styled iconoclasts (like the chain-smoking Marxist motormouths of my college days),who want to bury the past altogether. I would oppose the use of the term to the extent that it is used with a subtly dismissive spin, the intent of which seems (to me at least), to suggest a want of imagination, or to put it another way, an absence of “progress”, if “progress” is to be measured along the same tired old deconstructionist/Socialist/Satanist agitprop measuring stick some of these people would confine it to. Mark: You know, I really don’t care what you call us, as long as you listen to the darn music. What’s being said musically is what’s most important, in my mind. There’s a certain eternal connection your soul has with music, and that’s what Henry and I (at least) try to tap into. We try to knock on that door and make an impression on you that lasts – hopefully for a lifetime. Some music has done that to me, and it doesn’t matter one bit what its label is, or how people identify it. I just know that when I listen to it, it does something beautiful inside that words can never describe. My badge of pride would be to have that happen to at least one person with even a few bars of a tune that I wrote or helped to arrange. And now, the obligatory question about your songwriting process. How do you go about it? Does writing new material come easy to you? Mark: Very seldom does any one idea blossom into an entire tune for me. We’ve all got bits and pieces left over from other things, or short snippets of ideas that we constantly try to mix and match with each other’s fragments to see what fits. The cool thing that Henry and I like to do sometimes is to take an existing idea, throw it into a sequencer and flip it backwards or upside down, or even in retrograde inversion. That produces a lot of caca sometimes, and a good belly laugh other times—but every once in a while you get something really interesting that sticks. The middle section of “Awaiting the Call…” is actually an idea I had that was played in reverse, or upside down … I forget now. After a little revising, that became the dual acoustic guitar/mandolin part. Funny thing is, the original idea was just as good as far as I’m concerned. Who knows? You might hear that show up somewhere at some point. Henry: It varies. For most of Advent’s existence, we’ve tended to treat rehearsals as something of a songwriting workshop, where we’d each come in with sections of material prepared—sometimes collectively, though mostly individually—and try to move things forward section by section. Since we’ve got two locations equipped with recording facilities, that occasionally involves recording some of what we have in varying stages of completion to try to get more of a sense of how the final song is going to sound, and then make the inevitable adjustments where required. Starting from nothing, of course, tends to slow things down a bit—and since so much of the compositional process depends on finding the right arrangement for whatever raw material we’ve started with, it’s important to know early on whether the song idea in front of you has possibilities or not. Alan: We all approach the creative aspects of this task quite differently in my opinion—although I would also say that Henry, Mark, and I are all fairly consistent about wanting to develop our basic compositional structures and arrangements independently (before bringing the pieces into the group for additional input). I tend to spontaneously write small ideas on a regular basis, but it takes a concerted effort to turn one or more of these snippets into a complete piece of music—and this process typically involves a significant amount of time, effort, and discipline. In this regard, it really helps to have some kind of goal in mind which drives a commitment to get the piece done on some sort of schedule. On the next Advent CD, I also composed two short pieces with (our other guitar player) Greg. This was a very collaborative process that started with my beginning each composition, transcribing what I had into Sibelius (the music-notation program), and sending both scores and Sibelius-generated audio to Greg. He would listen to the results and compose his parts to match what I started—and then, upon reaching a certain point, Greg would take the lead and develop the following section of the tune, for which I’d have to go back and write my parts to match. Once in a while we’d come to some form of disagreement, but that would eventually get worked out. In the end, though, I’ve been tremendously pleased with the final results and really hope that Greg and I can continue to work in this fashion well into the future. As I wrote in my review, my first contact with the music of Advent was your contribution to Musea Records’s Dante’s Inferno 4-CD set. How did that collaboration come about, and what was your experience? Are you familiar with the literary work at all? Alan: If memory serves, Marco Bernard (Colossus) reached out to us directly and solicited our involvement in the project. Although Henry and Mark were a lot more familiar with the text than I, we all thought it sounded like something which could be right up our alley. The assignment also provided our first opportunity to collaborate with Greg on an original composition—something that went very well in my opinion. I also think Henry’s daughter (Thérèse) did a wonderful job on the vocals. Henry: I was already acquainted with The Inferno, having read it in college and once or twice since then—so when Alan informed us about the Colossus-based project to do a prog collection encompassing the first canticum of Dante’s Divine Comedy, I thought it would make for an interesting subject around which to build a composition. Happily, we were all in agreement about doing it, even though we knew it involved another redirection of focus away from the new CD. First of all, it was the initial (and only) Advent studio recording featuring the six-piece ensemble that had been gigging since the release of Cantus Firmus—and the tune also provided an opportunity to showcase Greg Katona’s formidable skills on classical guitar, for which he wrote his own part. The style of writing was quite a bit darker than is typical for us, which one might expect given the subject matter. Coming up with a “visual” program to describe the events in “Canto XXVI” took a few tries, but when it was completed, I was amazed at how compellingly Greg’s contribution captured Dante’s “lament” over Florence at the outset of the work. I would have enjoyed being a part of the Purgatorio and Paradiso collections as well, but there just wasn’t time for additional detours from writing our new CD. Congratulations to Marco, Colossus, Musea, and all involved, though—great idea! Mark: It was a very welcome experience as Alan and Henry have already pointed out. It was a little out of the way in terms of what we do, but the subject matter was an interesting one for all of us and enabled the band to stretch out a bit, compositionally. I’ve been aware of Dante’s Divine Comedy for years, but never read any of it until we signed on for the Musea/Colossus project. I read Inferno in preparation for what we were going to create, and I think that helped me a lot in the mixing stage. I started to read Purgatorio shortly after that and got through a decent part of it, but never finished. I’m confident I’ll get to the rest of it, and Paradiso, at some point. I’m a bit too busy right now, though. You seem to have a keen interest in literature as an inspiration for your lyrics. Can you tell me something more about it? Henry: I think we sometimes find it easier to form a compositional image when we have some sort of preexisting template to work from. Some people have difficulty visualizing a musical analog for a vibe communicated by a painting or a literary work, but we seem to manage it somehow. Perhaps growing up hearing everything from movies, to TV shows, to Warner Bros. cartoons, so skillfully set to music has left its mark. (I’m not sure.) Whatever the reason, the operation of transitioning from words-to-mental-picture-to-music seems a pretty natural one. I think it also helps that we all, by disposition, seem to have a preference for a type of lyric that most resembles poetry, where the images and references tend to be both varied and colorful. It seems to afford more room for the imagination to latch onto something useful in regard to projecting an atmosphere. Lyricists who write in that manner have a gift for finding ironic peculiarities in everyday things that most of us would miss—especially if things were not framed in quite the same way. I always felt that Arthur Hoffman (Advent’s lyricist on our earlier works) definitely had that “poet’s eye” and it made his imagery very easy to visualize musically. Alan, Henry and Mark play a number of instruments, and also sing. Which instrument do you privilege, and what is your approach to playing live and in the studio? Alan: While I play a fair number of instruments, I’m definitely most comfortable with guitar and bass, followed by Stick, violin, and mandolin. Beyond that, I tinker with things like recorder and flute—and still like sitting at a keyboard as often as time permits. I also love playing drums, but doubt that I’ll ever fulfill my fantasy of becoming the next Marco Minnemann. J Also, now that Advent has three impressively strong vocalists, I’m definitely the weakest link in this regard—but, like other things that extend beyond my natural abilities, I tend to compensate by practicing a lot. We generally record most parts individually—and, in these instances, I tend to favor recording multiple looped takes of sections that are generally of a short-to-medium length. Since I have to double as recording engineer in virtually all cases, this approach allows me some time after starting the recording (and sometimes having to jump into position following that) to “get into the zone” and deliver a truly musical performance. When I have to record something live with one or more band mates, though, my tendency is to just practice like crazy to internalize the parts as much as possible in advance—which is really the same strategy I use to prepare for performing on stage. Henry: I’m primarily a keyboardist who occasionally dabbles on the mandolin and guitar. Since a lot of what we do, both live and in the studio, involves fairly elaborate arrangements, we tend to use our instruments with an orchestral scope in mind. At present, we basically just try to reproduce, in a live setting, quite a bit of what we liked most about the recorded arrangements, with the occasional surprise worked in just to keep things interesting. Since this approach usually means rather involved performance demands on all of us, it tends to make for very busy hands (and sweaty palms) at gig time. That said, we all seem to prefer that to losing any part which one or more of us has come to enjoy hearing in the original, and the execution of the tricky bits seems to get better with each successive gig. 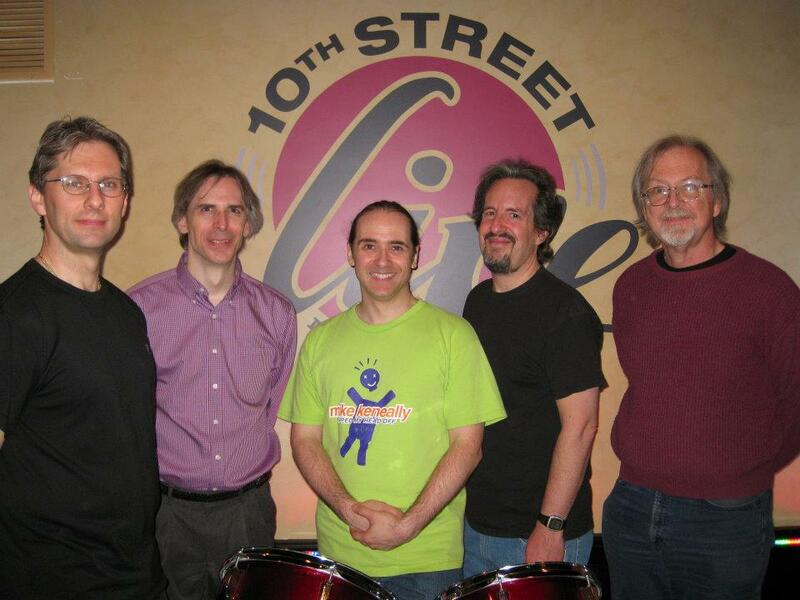 Mark: Henry and Alan (and Joe, our drummer) are the real multi-instrumentalists in this group. I pretty much stick to keyboards and singing. If you put some percussion stuff in front of me, I can bang on it well enough to give you something pretty cool. And I can program a pretty mean drum part, but that’s about it. Actually, come to think of it, I do play the radio pretty well (and pretty loud). As far as live-vs.-studio approach is concerned, it’s the same thing in both situations for me, with the exception of missing the audience in the one case (and sometimes in both, LOL). Honestly, I try to keep things the same for both instances to make the transition easy and smooth—same gear, same setup, etc. The less surprises, the better, as far as I’m concerned. The keyboards are hard enough as it is without adding to the complexity of the performance itself. Even as a group, the performance mirrors the rehearsal, really. We haven’t consciously tried to deviate from that up to this point. There hasn’t been a need to in our minds, I think. What have been your experiences as a live band? Alan: That’s a surprisingly difficult question to answer, actually. On one hand, I think we’ve enjoyed many special moments and have been very fortunate, at least on occasion, to connect rather significantly with our audience. Given the complexity of the music and the corresponding amount of preparation necessary for each show, though, it’s really a shame that we haven’t been able to perform more than three times a year thus far—and I’d really like to be able to play a series of gigs in a row (or, ideally, book a short tour) where we could leverage all this hard work and make the kind of performance-related refinements that only seem to come from playing in front of a live audience on a fairly consistent basis. On the bright side, I’m very happy that we played out again, for the first time in over two years now (and with the debut of our great new drummer, Joe D’Andrea), at the NJ Proghouse on December 11th – and having our talented young friends in The Tea Club on the bill as well was also a particularly special treat. Mark: We’ve been very fortunate to have some wonderfully talented people in this band over the years. But as with any ongoing project with which you may be involved, especially if you’re at its foundational level, there tends to be a few revolving-door positions as people come and go, which is fine. It makes it a little harder and things tend to take a bit longer as a result, but we still manage to put together an interesting show. All members, past and present, have really put in a lot of hard work for full-band rehearsals and countless hours of home preparation for material that is not very easy to get around. Believe me, for that we.re very thankful. When everyone is in the pocket and the energy is high, it really is a mind-blower. And that just goes to show that the material is good, in my mind. When you can get excited all over again with different people playing the same arrangements, I think that says a lot about the tunes and their arrangements. Henry: In general, quite good. Audiences have been wonderfully supportive, especially through all those critical first few performances when we were all sort of still finding our feet as a live band. Our second gig ever was at ProgDay, and the people there were most forgiving and kind—especially considering the jitters and mental lapses we were so vulnerable to in performing things like “Ramblin’ Sailor” in its entirety for the first time. We’ve also had nothing but good experiences with those people entrusted with getting us a good live sound, in what can only be described as a very difficult mix to get just right. Special thanks to Jim Zipf and also Kevin Feeley for their fantastic work and patience on this count. What is your relationship with the thriving New Jersey prog scene? Alan: Well, I’d say it’s all very much centered around the NJ Proghouse, all the organization’s incredible “staph” and leadership, and the network of amazing fans, musicians, and venues that support it all. Amy and I started as concertgoers, actually, first attending the (pre-Proghouse) Flower Kings/After the Fall show that took place in New Brunswick over a decade ago. After attending quite a few gigs and getting to know Jim and the gang, we were so appreciative to have the opportunity to hold Advent’s live debut at the Proghouse—and, since that time, Amy and I have both become very active “staph” members ourselves, helping to put on some of the most incredible shows I’ve ever seen. On top of that, our great friendship with Jim, Ray, and all the other “staph” members is probably the best part of it all. On a related note, how do you see the future of the US prog scene, especially after the announced demise of NEARfest after its 2012 edition? Alan: That’s another tough question. I think it’s getting increasingly harder for anyone to monetize their music in general, much less that which clearly falls outside of any commercially viable genre—and, while we’re based out of New Jersey, I get the sense that this is a global phenomenon (at least in general). NEARfest coming to an end is merely indicative of the larger problem, in my opinion. Inspired composers and musicians will always strive to make great music and I think that intelligent, imaginative, open-minded listeners will always seek something new to hear—and, hopefully, own. It’s a complicated subject, though, and there are a lot of factors that come into play, including things like declining disposable income, increasing availability of free music (whether legitimately streamed or illegally downloaded), and the fact the market for nostalgia-based fandom is starting to dry up (due to most of the prominent old-school acts already having performed big festivals like NEARfest or simply not playing anymore). When do you expect to release your new album? Have you already thought of a title? Mark: As has been already mentioned, we’ll be shooting for a 2012 release, and hopefully earlier in the year than later. We’ll see. It’s never an easy task with Advent compositions and arrangements, but we’re working hard to get it done as quickly as we can. There are a few titles floating around in our heads, but nothing that’s been discussed openly yet, I think. That will probably come as we get closer to the end of the mixing stage. I should also add that we will be using Michael Phipps again for cover art. He did an absolutely gorgeous job on Cantus Firmus and I can’t wait to start working with him again on the concept for the new release. Alan: I agree that we’re pretty well committed to having the album done in 2012, although I must confess to being a little less optimistic than Mark about the specifics and have a feeling that the second half of the year may be more likely. (I hope he proves me wrong, though.) Most of the tunes are fairly complete in terms of composition and arrangement at this point and quite a bit of recording has already taken place. As such, I think we have a pretty good idea of how it’s going to sound, but I wasn’t aware of any serious thoughts about the album title yet. I’ll have to see what the other guys are thinking. Do you have other plans for 2012? Henry: As of now, only two—release the best album we possibly can, and play in front of more people! Mark: Something tells me it’s going to be practice, practice, and more practice. Alan: From an Advent perspective, I’d say finishing up and releasing the new CD is definitely the top priority. After that, though, I really hope we can get back on stage and play a bunch of gigs. On a personal note, I hope to get a few collaborations into high gear and, perhaps, start working on recording some solo material. All: Thanks so much for the interview, Raffaella! We really hope that you and your readers enjoy it. All the best! Thank you for your time, and best wishes for the completion of your new album! My first contact with Advent’s music dates back from a couple of years ago, when I reviewed Dante’s Inferno, the first instalment of the monumental The Divine Comedy project released by Musea Records. The band’s contribution, a song called “Canto XXVI – The Evil Counselors”, impressed me as one of the most interesting tracks on that 4-CD set; therefore, I eagerly grasped at the opportunity to review their second album, Cantus Firmus – which, even if released exactly five years ago, is still recent enough not to qualify as a ‘vault’ review. While quite a few North American bands have taken the classic English progressive rock sound of the Seventies as their blueprint, no one, when listening to this album for the first time, would ever associate Advent with the bustling, overcrowded and down-to-earth East Coast of the US. Though hailing from New Jersey (home of a number of fine prog outfits, such as Shadow Circus, The Tea Club and 3rd Degree), here is a band that sounds more English than most contemporary English bands. Their love for the Old Country is evident right from cover artwork and logo (by artist and illustrator Michael Phipps), inspired by the stunning illuminated manuscripts of the Middle Ages. Formed in 1989 by two highly accomplished multi-instrumentalists with a wide range of musical interests, Alan Benjamin and Henry Ptak (whose brother Mark joined the band some time later), Advent released their self-titled debut album in 1997, and then dropped off the radar for nine years. After the inevitable line-up changes (notably the addition of drummer Drew Siciliano), in 2006 Cantus Firmus finally appeared, to a very warm reception. The album’s title, meaning ‘fixed song’ in Latin, refers to a pre-existing melody that forms the base of a polyphonic composition – another nod to medieval and Renaissance musical tradition. Like most acts, modern or otherwise, Advent have their own strong set of references, and are refreshingly honest about it. Though modern bands that openly pay homage to one or more of the prog greats of the Seventies are neither new nor surprising, Advent distinguish themselves from the myriad of Genesis or Yes-inspired outfits by having a rather unlikely pair of bands like Gentle Giant and Procol Harum as their main source of inspiration. Indeed, the band’s name brings to mind one of Gentle Giant’s most iconic songs, “The Advent of Panurge”. With such influences, it is not surprising that the music on Cantus Firmus is sophisticated, understated and devoid of hard edges – as well as admirably tight in compositional terms. Indeed, while not a concept, the album projects a sense of cohesiveness, with the first eight tracks acting much like the movements of a symphony. On the other hand, the two bonus tracks (both originally featured on the band’s debut album), though bringing the album’s running time close to a rather hefty 70 minutes, are not unwelcome additions, as they bear witness to Advent’s gradual but steady development of their own artistic personality. 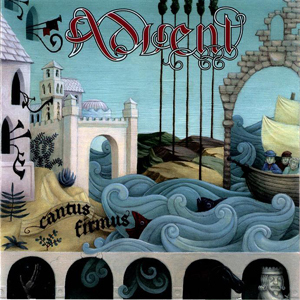 Advent’s love for everything Gentle Giant immediately surfaces in the opening track, the short but sweet “GK Contramundum”, dedicated to English 20th-century author Gilbert Keith Chesterton, and sung entirely a cappella. The song flows directly into “Awaiting the Call”, a lovely instrumental number with hints of Genesis and Camel in Alan Benjamin’s stately, melodic guitar solo and the lush, elegant sweep of the Ptak brothers’ keyboards. “Parenting Parents” and its companion piece “Your Healing Hand”, both dealing with the topic of the relationship between parents and their children, share the same keenly sentimental quality (which thankfully never descends into mawkishness): while the latter is very sparse, almost hymn-like in tone with its whispered vocal harmonies, the former couples lilting, madrigal-like passages of touching sensitivity with instrumental surges led by Benjamin’s fluid, crystal-clear guitar. “Utter Once Her Name”, a sparse, meditative number with a strong Gentle Giant vibe, and the hauntingly beautiful instrumental “Remembering When”, featuring some really inspired acoustic and electric guitar work, introduce the album’s centrepiece, the 18-minute “Ramblin’ Sailor”. Featuring the participation of Japanese band Kenso’s bassist, Shunji Saegusa, it is based on a traditional English folk song called “The Rambling Sailor”; the stunning complexity of its instrumental parts is relieved by the sprightly, cheerful nature of the contrapuntal vocal parts, including a chorus of ‘carousing sailors’. The magnificent central section is occasionally reminiscent of the stately yet riveting pace of Genesis’ instrumental compositions, while the titular sailor’s farewell to the sea is conveyed by a slower, more sedate passage enhanced by the distinctive sound of the recorder. The core of the album is then brought to a close by the upbeat, fanfare-like “Firmus Finale”, in which hints of Gryphon’s quirky take on medieval music join the Genesis and Gentle Giant influences. Though some might complain that Cantus Firmus is not a truly original proposition, and wave the dreaded ‘retro’ word around, the album – far from being a mere tribute-like effort – simply oozes class and dedication. In spite of the individual band members’ impressive chops, in this case technical skill is put at the service of the music, and not the other way round. Moreover, the emotional content is conveyed with grace and delicacy rather with the self-indulgent angst typical of may higher-profile bands. Gentler and more meditative than the output of bands in a similar vein such as Änglagård or Wobbler, Cantus Firmus will definitely appeal to fans of vintage prog of an eclectic bent – though some listeners might be turned off by its unabashed sentimentality and occasional church-like gravity. At the time of writing, Advent are working on their third album, which will hopefully be released within the year.